The NTSB has announced that American Airlines personnel breached safety investigation protocol in the Dec. 29 Jackson Hole runway overrun incident, and that the Board has revoked the party status of American and excused the airline from further participation in the investigation. December 31, 2010 –- On Wednesday, December 29, American Airlines flight 2253, a B-757-200 inbound from Chicago O’Hare International Airport, ran off the end of a runway in snowy conditions while landing at Jackson Hole Airport near Jackson, Wyoming. No injuries were reported among the 181 passengers and crew, and the National Transportation Safety Board (NTSB) is conducting an investigation, including analysis of both the cockpit voice recorder (CVR) and digital flight data recorder (DFDR). Today the NTSB announced that American Airlines personnel breached safety investigation protocol by downloading information from the DFDR before turning it over to the Board. “Although a thorough examination by our investigators determined that no information from the DFDR was missing or altered in any way, the breach of protocol by American Airlines personnel violates the Safety Board’s conduct for any organization granted party status in an NTSB investigation,” said NTSB Chairman Deborah A.P. Hersman. As a result, “we have revoked the party status of American Airlines and excused them from further participation in this incident investigation,” continued Hersman. Kodak discontinues Kodachrome—Yesterday the Eastman Kodak Co. announced that it is discontinuing Kodachrome. 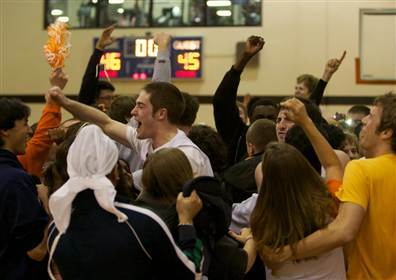 Caltech Beavers End 26-Year Losing Streak—On February 22, Caltech’s men’s basketball team won a Southern California Intercollegiate Athletic Conference game for the first time in more than 300 tries.